Dr. Brown late one night was awakened from a sound sleep by the phone ringing. He groggily groped for the receiver trying to find his glasses on the nightstand. It being the middle of the night the doctor drove across town quickly not having to fight the usual traffic. He drove into a neighborhood that was in a poorer section that was run down. He knew many who would not venture into this area even in the middle of the day. He found the street and then the house number but oddly no lights were on at the address. He hesitated, then grabbed his bag and walked up the steps to the door. He rang the bell and waited, no answer so he rang once more. He tried a third time--still no response. The doctor retraced his steps to the car looking to see if he might have read the number wrong. He had written the number “17.” He looked around but none of the homes on the block had lights on. He headed home wondering if it had just been someone’s idea of a good prank. He did not receive a follow up call that night or the next day so he soon forgot about the incident. Several weeks later he received a call from the hospital requesting he come to the emergency ward immediately. A nurse at the reception area told him that a patient who had been involved in a severe accident had begged the staff to call him. She told him the man did not have much longer to live. She escorted him into a large ward where a man heavily bandaged lay in a corner bed. Dr. Brown glanced at his chart but he did not recognize his name. Puzzled, the doctor moved to the side of the bed and nodded to the nurse to leave. The dying man continued. “Yes, of course.” Dr. Brown replied in a daze. The man’s grip loosened and fell from the doctor's hand. He had held it all this time. He took one last gasping breath and died. As Dr. Brown recounted this story to his brother he paused, "I suspected it was just a prank. I didn’t even know I had come so close to death. 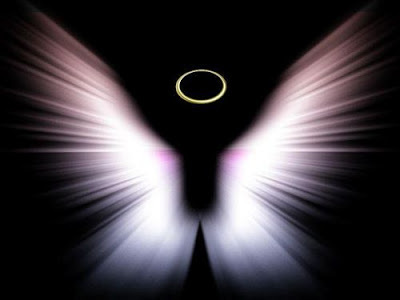 Let alone that my guardian angel had saved my life that night." He shook his head in wonder, "he only appeared to my assailant." 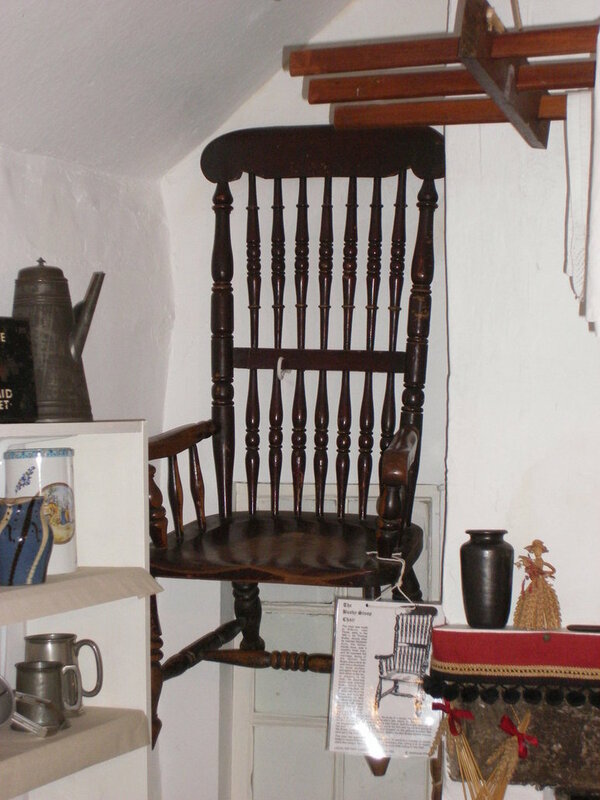 Today this chair can be found on display at the Thirsk Museum in North Yorkshire, England. It hangs on the wall five feet up in order to prevent anyone from sitting on it. 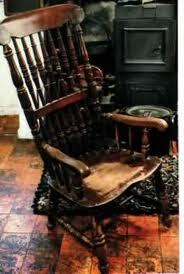 Legend states this infamous chair is cursed--if anyone “dares” sit in it they will shortly meet their death. This curse began in the 18th century. In 1702, Daniel Awety, a coin-forger bought a farm and named it Danotty Hall in the rural area of Kirby Wiske. His son-in-law, Thomas Busby who partnered him in crime was a thief, drunk and bully who owned an inn 3 miles from Danotty Hall. One day, Busby drunk as usual returned to his inn to find his father-in-law sitting in his favorite chair. He demanded Awety move immediately, but the older man refused. The two men got in a heated argument and Busby kicked his father-in-law out of the inn but not before Awety threatened to take his daughter back with him to his farm. Later that night, Busby sneaked into Danotty Hall and murdered Awety, he then hid his body in the nearby woods. But when it was noticed Awety had disappeared the local police organized a search. 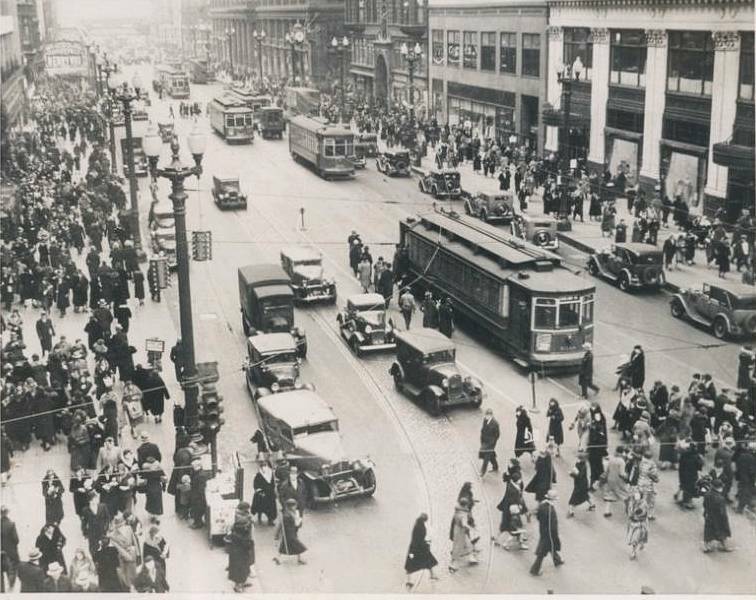 Awety’s body was found and Busby was arrested and sentenced to death by hanging. 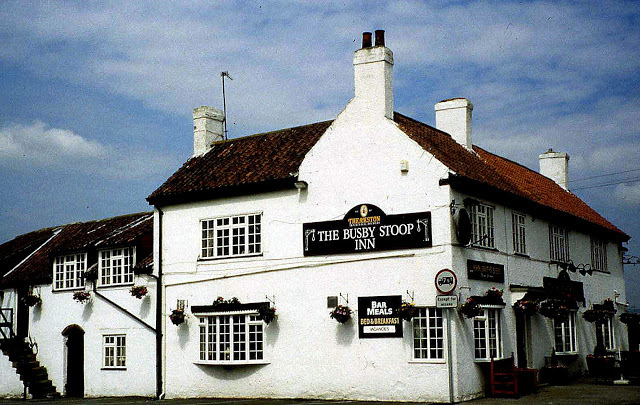 In the years following Busby’s threat, the inn was renamed Busby Stoop Inn. The new owner at first not believing in this curse kept the chair out on the floor for use. As news of the curse spread curious visitors started to flock to the inn. There were also reports that Thomas Busby haunted the inn. Reliable witnesses announced they had seen Busby’s ghost wandering around the second floor. This drew even more visitors to the Busby Stoop. 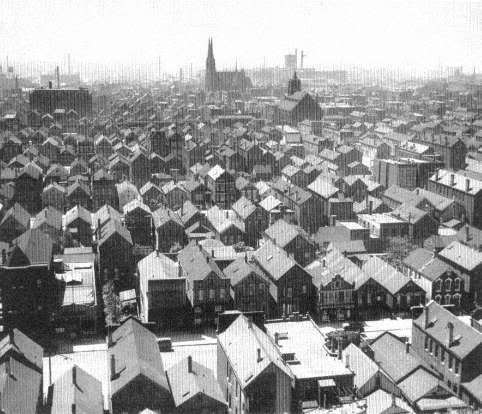 A chimney sweep who sat in the chair in the late 1800s was found dead the next morning. He was found hanging from a gatepost near where Busby was executed. This incident sealed people's belief in this curse. Friends would often dare friends to sit in the chair--although very few did. The few who were brave enough to take the dare all met untimely ends. During the Second World War across the road from Busby Stoop an airfield was built that the Royal Canadian Air Force used. These men would often partake of the inn’s ale. Several crewmembers were dared to sit in the Busby chair. Those who took the dare never returned home from bombing sorties over Germany. One previous owner tells how two airmen dared each other to sit in the chair. Both sat in the chair and later that day their car hit a tree and both men died. A group of builders having lunch at the inn dared a young worker to sit in the chair. This young man obliged and after returning to the building site he fell through a roof and died. After this death the landlord locked the chair away in the cellar. In 1978, a deliveryman sat in the chair in the cellar. He told the landlord it was a very comfortable. He suggested that such a fine chair should not be locked away in a damp cellar. Within hours after this, his truck veered off the road and crashed, killing him. There are many more stories connected to this cursed chair. An Air Force pilot was killed the day after sitting in the chair. A motorcyclist died on his bike shortly after leaving the inn, a hitchhiker was knocked down and killed two days after visiting the inn. A local man in his early thirties died of a massive heart attack the night after he sat in this chair. At a recent innkeeper’s request the Busby chair has been moved out of harm’s way. The chair had been in this inn for over 275 years. It is the most popular piece on display at the Thirsk Museum. Visitors still ask if they can sit in the chair but it is never taken down off the wall. 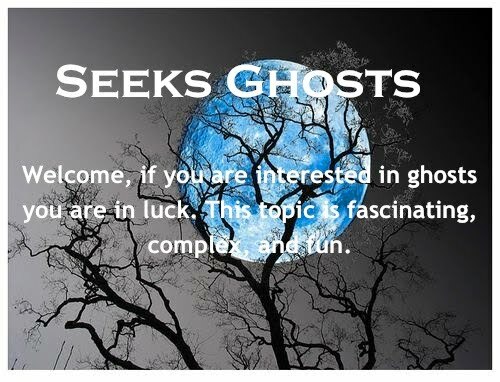 Although most people associate hauntings with buildings spirits can also attach to objects. In past posts I wrote about: Haunted Mirrors, a Haunted Doll called Annabelle, a haunted portrait at Shirley Plantation and recently, The Scorched Bed. In future posts I will share more stories about objects that are haunted. In 1849, Anna Baker was the third child of a wealthy family who lived in Altoona, Pennsylvania. She had the misfortune to fall in love with a worker without means. Her father Elias Baker, who made his fortune as an ironmaster refused to give his consent for the two to marry. He then used his power and influence to have this man kicked out of Altoona. Anna angry refused to marry anyone else. As the years passed she became a bitter old maid. When she died in 1914 she was still living in the family home. Before her father’s refusal, in happier times Anna had picked out a beautiful wedding gown that she intended to wear at her wedding. Within the year another Altoona debutante, Elizabeth Dysart * then bought this gown. She gloated for she knew Anna had hoped to wear it. Years later this wedding dress was given to the Blair County Historical Society who eventually donated it to a local museum. 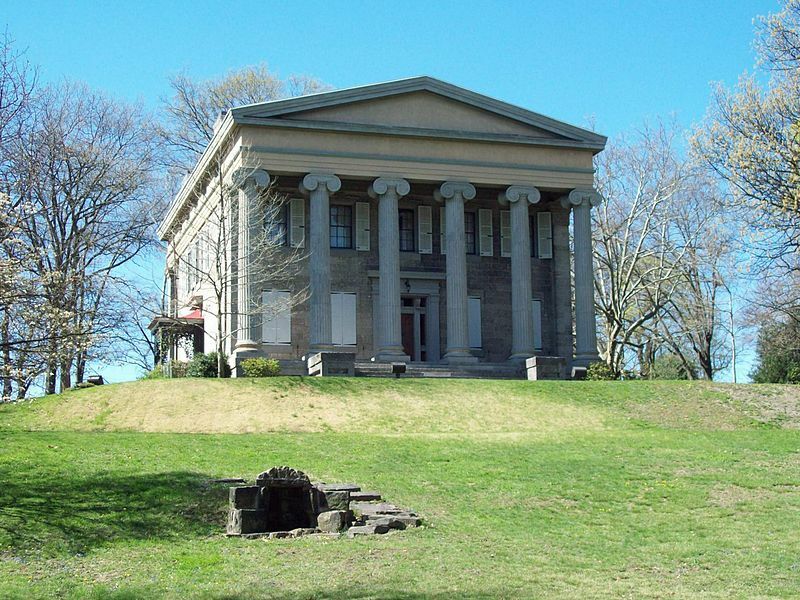 This museum is housed in what was once the Baker home. 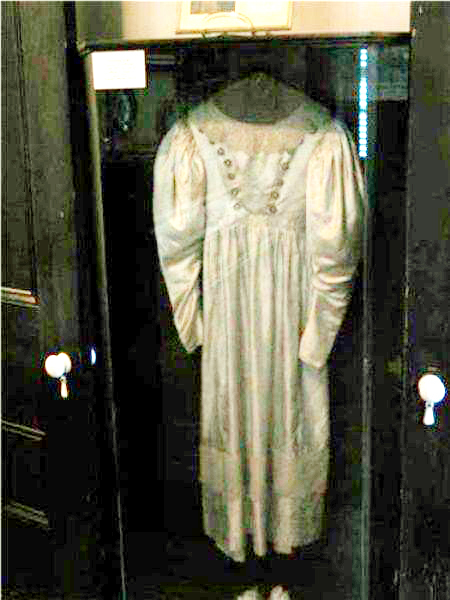 This wedding gown is displayed in a large glass case in a second floor room that once was the dressing room off Anna Baker’s bedroom. Witnesses have seen this dress move of its own accord--especially during full moons. This gown has been seen swaying from side to side. One witness stated it is as if a bride is holding this gown out in front of them as they admire it in a mirror. Investigators have searched for a draft in this room or any other possible cause but nothing has been found to explain why this dress moves. Some feel this dress moves because Anna Baker has just reclaimed what was supposed to be hers. * Elizabeth Dysart's maiden name was “Bell” her father was also an early Altoona ironmaster. ** According to the museum the dress is no longer on permanent display because of deterioration caused by exposure to sunlight and air pollutants. But one has to wonder if this is the real reason. Here is a brief summary of the history of the Baker family. My mother bought an antique bedroom set from a neighbor for a good price but there was one catch. Our neighbor told my mother that it was haunted. We soon discovered that a ghost named Jonathan now resided in our home. Jonathan’s antics included: unlocking doors, opening our kitchen cabinets, moving spoons and cups around and walking up and down our hallway. The only time Jonathan bothered me was one morning as I used the master bathroom. I saw the lock on the door turn and then it opened. Annoyed since I sat on the “throne” I told him I was busy at which point the door closed and I saw the lock turn again. Jonathan spoke to us once--through my father. One night my father retired early having gone on a long hike with the unit he was training. Surprised we saw him up and about shortly after this. He told us that when he lay down the sheets on the bed were warm but no one had been on the bed. He sat in his favorite chair and watched television with us. This is when we heard Jonathan’s voice. He told us his name and that he had died from grief several months after his wife had died. He mentioned that he had owned slaves. He told us that one night his bed had caught on fire when the bed warmer tipped over. The hot coals spilled out setting the linens on fire. Later when we examined the bed we found scorch marks in the lower left corner near the foot. Months later Jonathan alerted my sister and myself to the fact there was an intruder attempting to enter our home. Jonathan turned on the back porch light and we saw a face in the sliding glass door as he tried to jimmy the door. My father entered the room and turned on a light. We watched as the intruder jumped two chain-link fences to get away. When my father was transferred overseas we lost Jonathan for my parents sold the bedroom set. Most of my family’s experiences with Jonathan were positive. Sometimes I wish we still owned that bed.